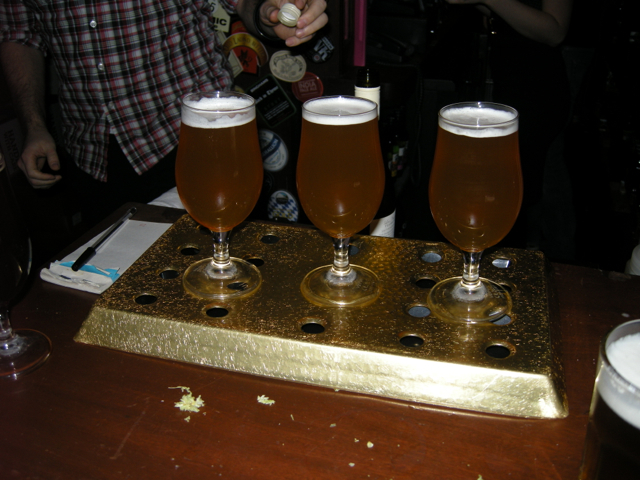 Battle of the hops: Can Jester take on the Americans? As you may know I’m a big fan of hops but I worry for them a bit. The UK grows nothing like as many as it used to and, although many beer fans – myself included – love them, the big flavours and aromas of US hops along with varieties from ‘Down Under’ threaten to overshadow British hops and therefore lead to a further decline in the amount grown. Which is why UK hop merchant Charles Faram & Co, along with Liberty Beer and Moor Beer Co are behind the launch of a brand new British variety called Jester. 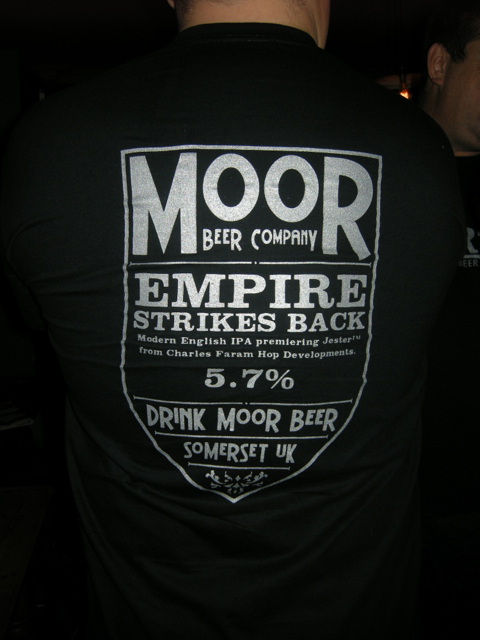 The new hop is being showcased in a 5.7% Moor IPA appropriately named Empire Strikes Back. Ahead of the launch Charles Faram MD Paul Corbett told me Jester has a lovely ‘New World style aroma’ and said he was hopeful this would carry through into the flavour of the beer – if his hopes are realised this could be a significant moment not just for the UK hop industry but also for the nation’s beer and brewers. So…I battled through floods (pretty much literally) to get to London for the launch of this new hop because if it does make history I wanted to be there to see, taste, rub and sniff it being made. Jester is a very oily hop; very sticky when you rub it. Even before rubbing you could smell its strong, hempy aroma which changed to grapefruit and lychee once crushed. I could smell the promise of it and became even more excited at the prospect of tasting the beer. 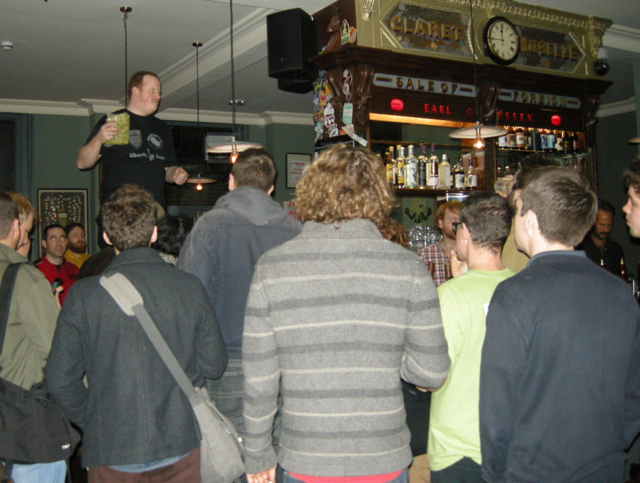 Will Rogers of Charles Faram & Co Ltd unveils the new hop, Jester at The Earl of Essex pub N1. A cask and a keg version have been brewed (but only 20 barrels exist) and they are very noticeably different. In cask it has a creamy pineapple aroma but the taste is zestier than the smell. Grapefruit marmalade sprang to mind. This is a very fresh tasting, massively tangy, crisp, dry and bitter beer – with a US hop character which made me immediately feel Jester had achieved what it was bred to do. In keg the beer is a big hop bomb. Even more American than in cask. Lemony citrus flavours make for a crisp beer with a ‘leafy’ character giving way to a subtle caramelised/ barley sugar aftertaste. This is a beer that could sit alongside the likes of Chicago’s Goose Island IPA, Californian offerings like Bear Republic’s Racer 5, or homegrown foreign hop brews like Brewdog’s Punk IPA and not only hold its own but fit right in. Not only has the new hop produced a thoroughly delicious beer it also presents a beacon of opportunity and hope for the whole UK hop industry because it has proved that UK ‘terroir’ (soil, weather and climate) is capable of producing a ‘big flavour’ hop of our own. Overseas varieties could be grown here, but wouldn’t taste the same so we’ve invented a UK hop to do the job. But it’s going to require further investment, not just of the financial variety, if the hop and brewing industries are to really be able to make the most of what it offers.This year’s crop was a genuine pilot producing a yield of just 60kg. Next year’s should produce more but it will be a while before Jester can be considered a commercial variety. Seek out Empire Strikes Back and taste for yourself how good a beer it is because of our new big-hitting British hop. It may be called Jester but its potential is no joke. Hi Sophie, I hope you are well. Great to see you championing our hops. I would love to try some of this beer so shall do some research! Hope your journey back to the West Country was safe!